Smile for the camera - no searching for tickets any longer! Face ID for events, biometric access control or facial recognition - does everything sound like music of the future to you? But it's not at all! Face-ID has already established itself in our world and in the event industry. The use of Face-ID is not new. Apart from events, the technology has already been used for years, for example at airports and in marketing. For you as an organizer, speed at the entrance is important. Nothing is worse than queuing. Then your attendee starts the event annoyed. Now you will certainly say: But it is also quick with Pick-Up-Ticket. Yeah, that's fine, of course. We work mainly like this. However, the problem arises when the first guest comes without a QR code. Then they search in bags and emails. This causes traffic jams at the entry. Your attendees could also pass on QR codes. Persons who were not invited at all could gain access to your event. The face, you always have with you and is a clear marker! The guest smiles nicely into the camera - and holds his badge in his hand the next moment. Set-up on site is just as simple as registering for your guest. The kiosks are space-saving, measuring just 40 x 40 cm. A kiosk with camera is set up and ready for use in approx. 5 minutes. You see: Face recognition makes you fast. 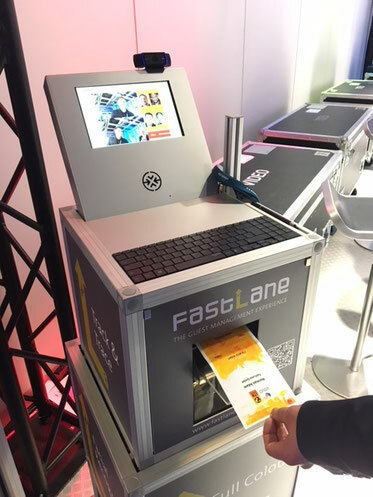 And so fast that you can register up to 400 participants per hour per badging kiosk. Are you planning an event with high security requirements? The unique facial biometry allows you to ensure one thing: Only the guests you have invited come to your event. You can avoid passing on QR codes, vouchers or tickets in this way. Detailed information on how it works and everything about data protection can be found here.